A rose is a woody perennial of the genus Rosa, within the family Rosaceae. There are over 100 species and thousands of cultivars. They form a group of plants that can be erect shrubs, climbing or trailing with stems that are often armed with sharp prickles. Flowers vary in size and shape and are usually large and showy, in colours ranging from white through yellows and reds. Most species are native to Asia, with smaller numbers native to Europe, North America, and northwest Africa. Species, cultivars and hybrids are all widely grown for their beauty and often are fragrant. Rose plants range in size from compact, miniature roses, to climbers that can reach seven meters in height. 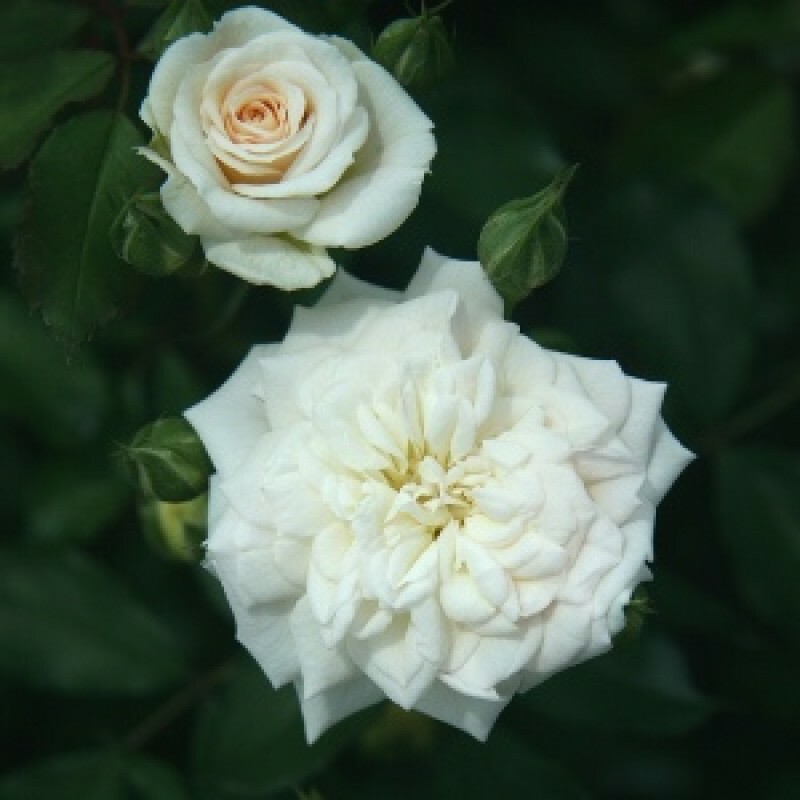 Different species hybridize easily, and this has been used in the development of the wide range of garden roses. The leaves are borne alternately on the stem. In most species they are 5 to 15 centimetres (2.0 to 5.9 in) long, pinnate, with (3–) 5–9 (–13) leaflets and basal stipules; the leaflets usually have a serrated margin, and often a few small prickles on the underside of the stem. Most roses are deciduous but a few (particularly from South east Asia) are evergreen or nearly so. The hybrid garden rose "Amber Flush"
The flowers of most species have five petals, with the exception of Rosa sericea, which usually has only four. Each petal is divided into two distinct lobes and is usually white or pink, though in a few species yellow or red. Beneath the petals are five sepals (or in the case of some Rosa sericea, four). These may be long enough to be visible when viewed from above and appear as green points alternating with the rounded petals. There are multiple superior ovaries that develop into achenes. Roses are insect-pollinated in nature. The outer petals are referred to as guard petals when used in bouquet arrangements and are best removed. Guard petals are thicker, more rugged outer petals that protect delicate inner-petals from insects, elements and dehydration and will often begin to wither before the rest of the flower. The aggregate fruit of the rose is a berry-like structure called a rose hip. Many of the domestic cultivars do not produce hips, as the flowers are so tightly petalled that they do not provide access for pollination. The hips of most species are red, but a few (e.g. Rosa pimpinellifolia) have dark purple to black hips. Each hip comprises an outer fleshy layer, the hypanthium, which contains 5–160 "seeds" (technically dry single-seeded fruits called achenes) embedded in a matrix of fine, but stiff, hairs. Rose hips of some species, especially the dog rose (Rosa canina) and rugosa rose (Rosa rugosa), are very rich in vitamin C, among the richest sources of any plant. The hips are eaten by fruit-eating birds such as thrushes and waxwings, which then disperse the seeds in their droppings. Some birds, particularly finches, also eat the seeds. Rose thorns are actually prickles – outgrowths of the epidermis. While the sharp objects along a rose stem are commonly called "thorns", they are technically prickles — outgrowths of the epidermis (the outer layer of tissue of the stem). (True thorns, as produced by e.g. Citrus or Pyracantha, are modified stems, which always originate at a node and which have nodes and internodes along the length of the thorn itself.) Rose prickles are typically sickle-shaped hooks, which aid the rose in hanging onto other vegetation when growing over it. Some species such as Rosa rugosa and Rosa pimpinellifolia have densely packed straight prickles, probably an adaptation to reduce browsing by animals, but also possibly an adaptation to trap wind-blown sand and so reduce erosion and protect their roots (both of these species grow naturally on coastal sand dunes). Despite the presence of prickles, roses are frequently browsed by deer. A few species of roses have only vestigial prickles that have no points. Roses are best known as ornamental plants grown for their flowers in the garden and sometimes indoors. They have been also used for commercial perfumery and commercial cut flower crops. Some are used as landscape plants, for hedging and for other utilitarian purposes such as game cover and slope stabilization. They also have minor medicinal uses. The majority of ornamental roses are hybrids that were bred for their flowers. A few, mostly species roses are grown for attractive or scented foliage (such as Rosa glauca and Rosa rubiginosa), ornamental thorns (such as Rosa sericea) or for their showy fruit (such as Rosa moyesii). Ornamental roses have been cultivated for millennia, with the earliest known cultivation known to date from at least 500 BC in Mediterranean countries, Persia, and China. Many thousands of rose hybrids and cultivars have been bred and selected for garden use as flowering plants. Most are double-flowered with many or all of the stamens having mutated into additional petals. In the early 19th century the Empress Josephine of France patronized the development of rose breeding at her gardens at Malmaison. As long ago as 1840 a collection numbering over one thousand different cultivars, varieties and species was possible when a rosarium was planted by Loddiges nursery for Abney Park Cemetery, an early Victorian garden cemetery and arboretum in England. Roses are a popular crop for both domestic and commercial cut flowers. Generally they are harvested and cut when in bud, and held in refrigerated conditions until ready for display at their point of sale. In temperate climates, cut roses are often grown in glasshouses, and in warmer countries they may also be grown under cover in order to ensure that the flowers are not damaged by weather and that pest and disease control can be carried out effectively. Significant quantities are grown in some tropical countries, and these are shipped by air to markets across the world. Rose perfumes are made from attar of roses or rose oil, which is a mixture of volatile essential oils obtained by steam distilling the crushed petals of roses. An associated product is rose water which is used for cooking, cosmetics, medicine and in religious practices. The production technique originated in Persia then spread through Arabia and India, and more recently into eastern Europe. In Bulgaria, Iran and Germany, damask roses (Rosa × damascena 'Trigintipetala') are used. In other parts of the world Rosa × centifolia is commonly used. The oil is transparent pale yellow or yellow-grey in colour. 'Rose Absolute' is solvent-extracted with hexane and produces a darker oil, dark yellow to orange in colour. The weight of oil extracted is about one three-thousandth to one six-thousandth of the weight of the flowers; for example, about two thousand flowers are required to produce one gram of oil. Rose hips are occasionally made into jam, jelly, marmalade, and soup or are brewed for tea, primarily for their high vitamin C content. They are also pressed and filtered to make rose hip syrup. Rose hips are also used to produce Rose hip seed oil, which is used in skin products and some makeup products. The rose hip, usually from R. canina is used as a minor source of Vitamin C. The fruits of many species have significant levels of vitamins and have been used as a food supplement. Many roses have been used in herbal and folk medicines. Rosa chinensis has long been used in Chinese traditional medicine. This and other species have been used for stomach problems, and are being investigated for controlling cancer growth. plants height with pot is 1.5 feet and pot size is 5 inch diameter. Required watering once in a day.